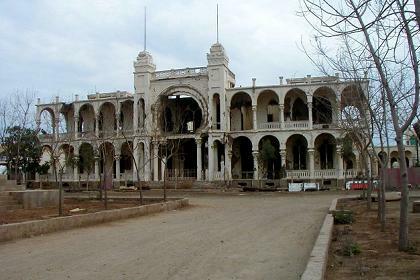 The island Batse comprises the ancient historical center of Massawa and a marvelous place to wander about. 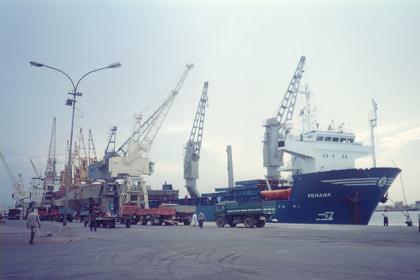 It is dedicated to port activities. This part of Massawa was badly damaged at the end of the 1961-1991 war of liberation, when Ethiopia bombed the city off and on for months. Massawans are busy reconstructing the architecturally significant buildings, many of which are build using coral blocks. There are many interesting architectural features to be found. It has two mosques which are the subject of special historic interest: El-shiafei, which was founded some eight hundred years ago, and Sheikh-Hammali built (and subsequently rebuilt) in the sixteenth century. Other highlights are the former Italian Bank, the decorative facade of the house of Mammub Mohammed Nahari and the many carved wooden doors, shutters and balconies. In the side-streets opposite the harbour you will find a 17th-century coral-block house, coral having once been the traditional building material for Massawan abodes. 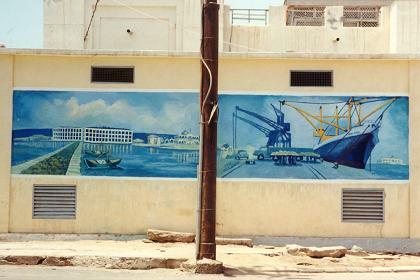 Artist impression of the port of Massawa on one of the walls. 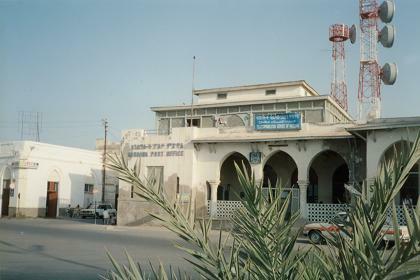 Post office and telecommunications office of Massawa (1999). 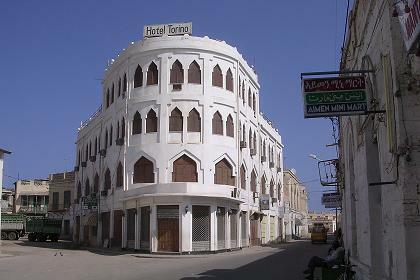 Hotel Torino is one of the low budget hotels in Massawa (1999). tel +2911 55 28 55. 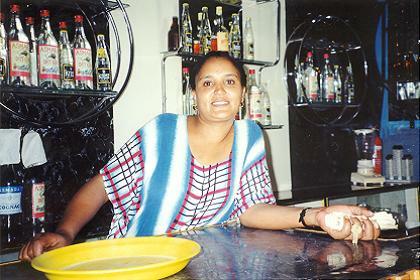 Savoya Hotel, also a low budget hotel (docks' entrance Massawa). tel +2911 55 26 20. 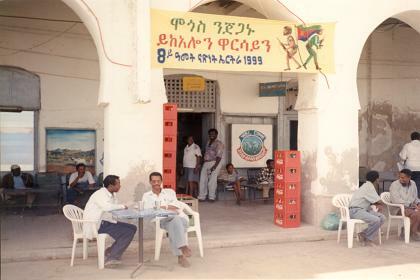 Detail pictured in 1999 (8th anniversary of Eritrean liberation. 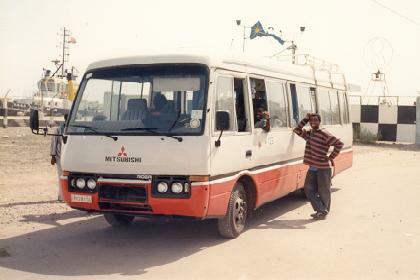 Docks' entrance Massawa - minibus to Asmara. of goods unloaded - 345,817,554 tons of goods exported. 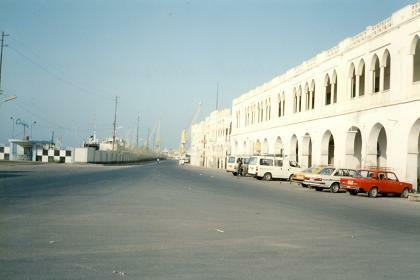 next to the main entrance to the Massawa port. my favorite place to rest and drink (your skin will piss it out). As you can see, Saba is terrible in love with my US dollars.